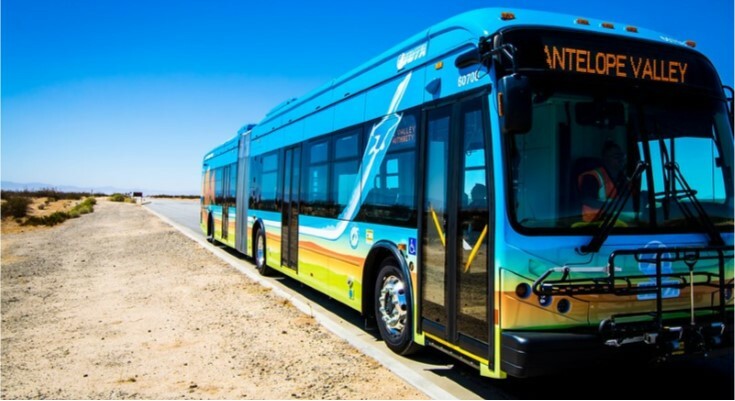 LANCASTER – The Antelope Valley Transit Authority is offering free bus rides to furloughed federal employees to offer assistance during the duration of the partial government shutdown. The agency’s Board of Directors voted unanimously to offer the rides — effective immediately — at Tuesday’s regular meeting. The free bus rides are provided on all of AVTA’s bus routes, including the local transit routes in the Antelope Valley; the AVTA commuter routes, with service stops in downtown Los Angeles, West Los Angeles, the San Fernando Valley and Edwards Air Force Base; and the North County TRANSporter to Santa Clarita. To take advantage of this assistance, federal employees must show valid federal employment identification upon boarding any AVTA bus. AVTA is also offering a complimentary 31-day bus pass on local transit routes to these employees, who must come in to AVTA headquarters in Lancaster to obtain it. 19 comments for "AVTA offering free bus rides to furloughed federal employees"
Me too just reporter sicko Child Molester Pete to Major Crimes they need to look into his Child Molester Remarks about hurting Children So Disgusting. I THOUGHT MEXICO WAS GONNA PAY FOR THE WALL AND NOT AMERICAN TAXPAYERS ALONG WITH WITHHOLDING OUR FEDERAL WORKERS THAT DID NOT RECEIVE PAYCHECKS FO CHRISTMAS PRESENTS FOR THEYRE KIDS AND FAMILY I BET THEY WILL VOTE DONALD CHUMP OUT OF OFFICE FOR MAKING THEM BEG FOR FOOD AND HANDOUTS WHAT A SHAME. First off. Whose paying for all the free rides? (Tax Payers). Tax payers already pay for their inflated salaries and benefits. My question is… Where is the over taxed tax payers break? Gov. should stop stalling and approve the wall funds. They approved Obamas stimulus package debacle that cost 831 Billion Dollars to the tax payer. and we wont approve a 5 Billion budget for added (I repeat added, not a complete measure but a start) security. We wouldn’t put in a door and not windows in a home.. Approve and move on. For all you idiots out there that talk out of your backside. A president that fights to complete his promises to the people is a good president. Not the best spoken or political… But good. What “people” did he make this promise to? The majority of Americans recognize that his wall is a stupid idea that won’t solve anything. Griping about taxes while saying taxpayers should pay for his boondoggle monument out the other side of your face is…interesting, in a clinical sort of way. Translation please…. Both Republicans and Democrats came together to create a funding bill, that bill was signed into law by a President freshly in office taking over after 8 years of Republican decision making that were partially to blame for the recession. Now, we have a president and had a Republican majority that decided early on that any debt is no problem for future generations. After all, the leader has filed bankruptcy many times and walked away without seeming to be blemished. It will cost for a long time to come, and this is the first two years, two to go still. This Dude Trump is a Vile POS.! Hey, quit comparing trump to a POS. It’s not fair to the POS. It’s time to end the Trump/McConnell Shutdown. Orange Clown and Grandpa Turtle need to reopen the government and stop holding peoples’ livelihoods hostage. FEEL SO SORRY FOR THEM ASKING FOR HANDOUTS AND FREE FOOD DUE TO THIS TRAITOROUS CRIMINAL PRESIDENT THAT SAID THAT MEXICO WAS GONNA PAY FOR THE WALL WHAT A [removed] LIE.! CANT WAIT TO SEE HIS [removed] IN A FEDERAL PRISON FOR TREASON AND CORRUPTION ALONG WITH MANAFORT. Imagine what it’s like for the Coast Guard…no pay, but if you don’t show up for work you get charged with being AWOL under the Uniform Code of Military Justice. How’s that for MAGA by bringing back slavery? Imagine what it feels like to have a loved one killed by an illegal person.an illegal that was let in,and protected by democrats.they have blood ontheir hands. No one is being “let in.” Get off the Breitbarf juice, it’s rotting your mind. I sure hope your daughter doesn’t get gangraped,murdered,and cut up into little pieces. By the ones that you think don’t get let in. Don’t lie Pete. If you weren’t hoping for it at least a bit you’d not have brought it up. Meanwhile, other than nonsense from Breitbarf et al, what evidence do you have on this “let in” BS that you continue to claim? Probably feels the same way as having a loved one killed by a citizen, which statistically happens more often. What’s your point? Pete…Every single family member that has had a loved one murdered, is disgusted by people politicizing the death of their loved one. Stop it, Pete! Pete and the republicans would be credible if they showed as much concern when a white guy shoots up a school, church, movie theater, synagogue, etc., as they do when a guy here illegally commits a murder. BUT, THEY DON’T, DO THEY? They want everyone to just move along nothing to see here after a mass shooting by an American citizen who is a white guy. They even called the students at Parkland who became activists names like “crisis actors”. Bottom line. Pay Pete and his ilk no attention. Their free speech doesn’t mean we have to listen to them or give their views any consideration. None whatsoever. They gave up any right to be heard and taken seriously long ago.